Blueberries are full of health benefits and help brain function, reduce inflammation and protect us from infection. Blueberries are very small but loaded in nutrients including vitamin C, vitamin K and manganese. They are very low in carbohydrates, unlike some other fruits, and contain high levels of anti-oxidants, predominantly bioflavonoids. The active component of these flavonoids is anthocyanidin which has powerful health benefits. The most notable of these benefits is their ability to reduce DNA damage. The oxidation of DNA forms free radicals and occurs constantly in our bodies, and excessive amounts lead to accelerated ageing and cancer. Blueberries, being high in anti-oxidants, can neutralise some of these free radicals. The oxidation of cholesterol, specifically the LDL (low density lipoproteins) and VLDL (very low density lipoprotein) cholesterol, can lead to heart disease. 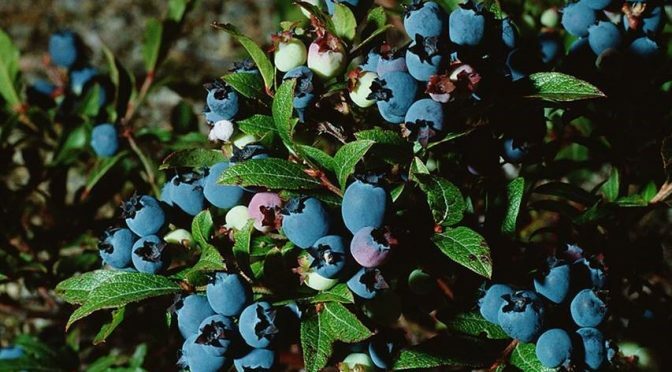 Half a cup of blueberries per day can reduce LDL levels. They have also been shown to enhance cognitive function and reduce the age-related decline in brain-neuron signalling. Blueberries are astringent and contain tannins which can be used in the treatment of diarrhoea. For this purpose, a strong decoction needs to be made from them. This has been proved to be a valuable remedy for dyspepsia and diarrhoea in children. The blue pigment (anthocyanidin) enters the intestinal mucosa forming a protective layer and reduces inflammatory secretions. It has an affinity for bacterial cells and inhibits their growth thus naturally treating infection. Because of the astringent and antiseptic properties of blueberries, a decoction can reduce gum inflammation when used as a mouth wash. To make a decoction, simmer half a cup of mashed blueberries in two-third of a cup of water for ten minutes with the lid off, then strain. Blueberries are great added to a muesli or smoothie, or in a cake, or made into a topping for a cheesecake. Start the New year with a Detox! Can I be Vegan on a Paleo Diet? Is a Gluten-free Diet Always Necessary? Trans Fatty Acids – Which vegetable fats are the healthy ones? I look forward to speaking with you and discussing your health. view to health (c) all rights reserved.